European trade with Iran has increased 93 percent since the ratification of the Iran deal – that it is an economic boon for Europe, Max Blumenthal, author and journalist, told RT. The six other signatories say they will honor the deal, he added. 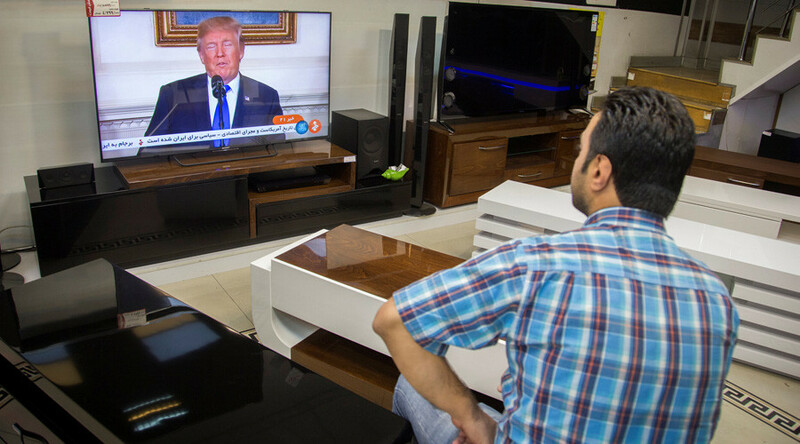 US President Donald Trump said that the termination of the Iran Nuclear deal is a “very real possibility,” adding that Teheran is violating the agreement. Last week, the US leader refused to certify the 2015 nuclear deal, which does not formally terminate the agreement agreed upon by the previous administration of Barack Obama and world powers, including Russia, France, Germany, the UK and China. 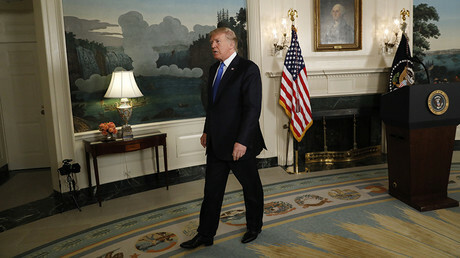 Trump’s announcement gives Congress 60 days to decide whether to re-impose sanctions, lifted in exchange for halting Tehran’s nuclear activities. Prime Minister May issued a joint statement on Friday together with German Chancellor Angela Merkel and French President Emmanuel Macron in support of the landmark 2015 Iran nuclear deal signed by six world powers plus Iran. RT: Trump hinted that the termination of the Iran Nuclear deal is a “very real possibility.” He went further though, saying that all can turn out very positive. Why such a discrepancy? What did the president actually mean? MB: What Trump says he wants to do is to renegotiate certain aspects of the deal, which are core aspects of Iran’s strategic deterrence policy. In order to weaken Iran regionally, they specifically relate to Iran’s production and testing of intercontinental ballistic missiles, which are conventional and which are not forbidden by the deal. Iran’s relationship with allies, like Hezbollah, the Houthis in Yemen, like the Shia militias and the Iraqi government, along with its civilian nuclear program – these are all core aspects of Iran’s strategic deterrence policy, and the way that it projects itself throughout the region. Iran has abided by the deal in every aspect. That has been affirmed by the International Atomic Energy Agency (IAEA.) It’s been confirmed by the UN Security Council. Iran will not renegotiate the deal. So if Trump attempts to sanction Iran over any of these three aspects of its strategic deterrence policy that I mentioned, we could see Iran double down on ICBM testing. We could see something flare up in Yemen, or in the Persian Gulf. We’ve already seen the US military attack Iran’s allies on the Syrian–Iraqi border. This could quickly spiral out of control. So Trump promising more positive results seems absurd. What he is setting the stage for is more danger and an extremely negative result that could result in a regional conflagration. RT: If indeed the US terminates the deal, what would that actually mean for the agreement itself, as it has six more signatories? Can these countries go forward with the deal without the US? MB: Absolutely, the deal can go forward without the US, and that is the precise language we’ve been hearing from Emmanuel Macron in France, who said he warned Trump not to shred the Iran deal from Angela Merkel in Germany. The six other signatories of the Iran deal are adamant that they will continue. We have to consider that European trade with Iran has increased 93 percent since the ratification of the Iran deal – that it is an economic boon for Europe, and the governments of Europe will protect companies that are doing business against Trump’s will. We also have to take into consideration that Trump’s own secretary of state and his key national security advisors and its defense secretary are taking the European position against the President of the US. So that gives cover to figures like Macron and Merkel. If there is any issue on the ICBM, for example, the Europeans will likely negotiate directly with Iran, while Trump protests, heckles and trolls with his Twitter account in Washington. RT: What can be done to offset the damage if Trump goes ahead and walks away from the deal? MB: It is unclear what anyone can do with Donald Trump. It does seem apparent that the adamant posture from Europe in support of the Iran deal, along with the fact that Iran has abided by the deal in every aspect faithfully, there’s simply no evidence of its violation - means that the only thing that can really sabotage the deal, which is a very real possibility, is Trump’s strategy, which is to send the deal back to Congress for another vote. The US Congress is under the influence not of any American interests when it comes to Iran necessarily. There is heavy influence in the American Congress from the pro-Israeli lobbies and the neo-conservative elements, including pro-Israel billionaires like Sheldon Adelson, who contributed something like $40 million to Trump’s election campaign. So Congress is the X-factor here. It could sabotage the deal irrespective of what the Europeans want. This would set the stage for a dangerous scenario in the region around Iran. RT: The agreement has been worked on for nine years. How about the effort? Can all this work be erased simply like that? MB: You see the work has borne out real results economically in Europe and in Iran; it has also borne out political results. It helped accelerate the internal process of reform inside Iran, where reformist elements are consolidating their power – most notably Hassan Rouhani. What it seems like to me and to many other observers of Trump’s strategy, which is heavily influenced by Israel, by Saudi Arabia, by the United Arab Emirates UAE, by the enemies of Iran in the region - is that Trump is attempting to kill the deal through death by a thousand cuts; by seeking to renegotiate; by undermining Iran’s geostrategic deterrence policy. It looks like Trump is embracing a stealth attack on the deal that is aimed at forcing Iran itself to withdraw from the deal in frustration. The question is: will Iran fall for the trap that Trump has set. It doesn’t appear that they are foolish or self-destructive enough to do that. It seems like they much prefer to wait out this administration.